With the ArcGIS Online update in March, Esri added a new group of web application templates called the Early Adopter Templates. This group contains new beta templates to show off your maps. You can use the template in your organization after you complete a few steps. 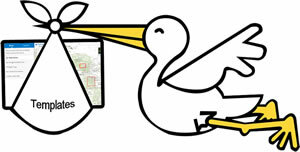 Then you'll be able to publish your map into an awesome configurable app! Step one. Create a group within your ArcGIS organization to store the templates you'd like to expose to users. Step two. View the early adopter templates from your organization. 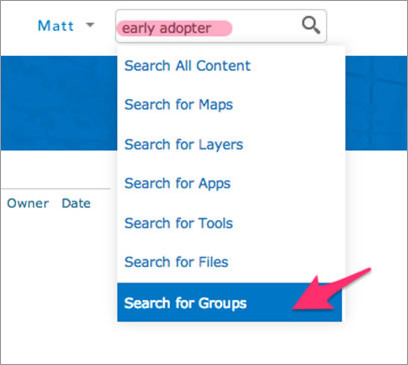 Search for Early Adopter Templates in groups and uncheck the option to search only in your organization. Step three. Share an early adopter template from the Early Adopter Templates group into your organization's templates group to allow users within your organization to publish apps based on the templates added. 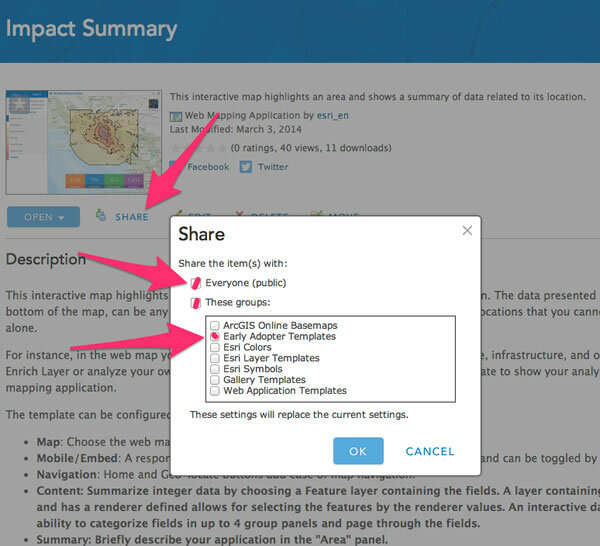 In this example below, the Impact Summary template has been added. Step four. Go to My Organization > Edit Settings > Map > Web App Templates and choose your group from the drop–down menu. Step five. If you would like to include all the Esri templates, as well as your custom templates, check the Share the Esri default web application templates to this group check box. Step seven. 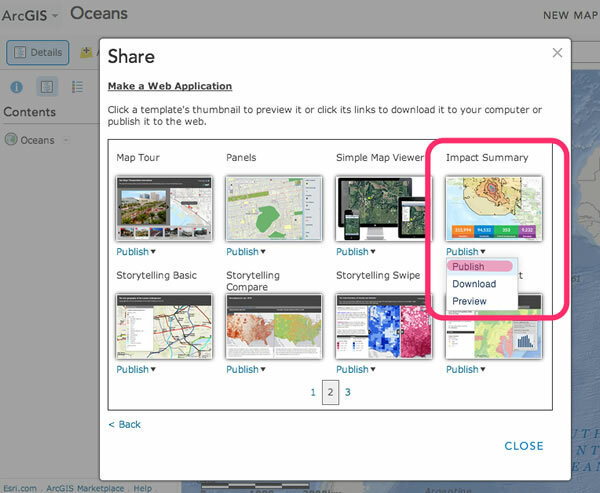 Go to the map viewer and share as a web application using the newly added template. 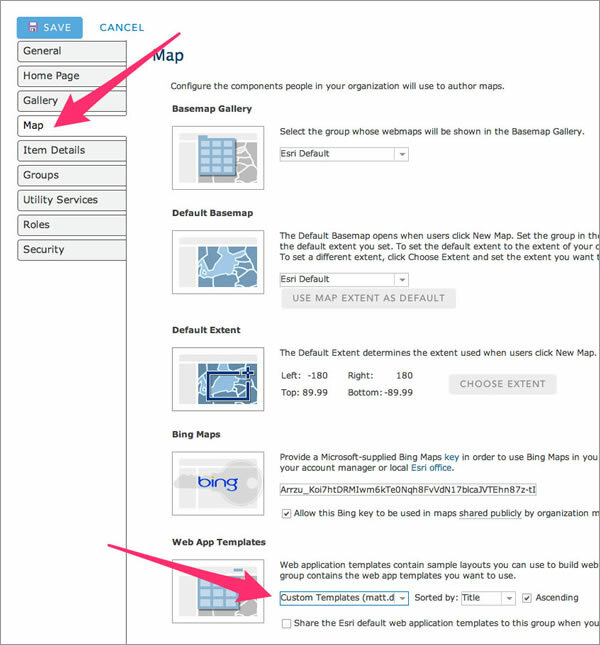 This will provide your users with the option to create applications from any of the Esri default web app templates and the early adopter templates from within the map viewer. To report bugs and provide suggestions, you can post a comment on the template item, contact Support, or create an issue on the template's GitHub repository. With your help, we can make these early adopter templates better for the next release. We look forward to hearing your feedback!